A thunderstorm of palpitating jazz and punkish threats is about to hit the Archspace in East London. Since 2008, Metá Metá has been driving the underlying and caustic alternative music scene in São Paulo, from post-rock jazz to Afro-samba, with vents of punk. Get yourselves on alert, ’cause this show on the 5th of June may genuinely concern those interested in London’s current alternative jazz scene. 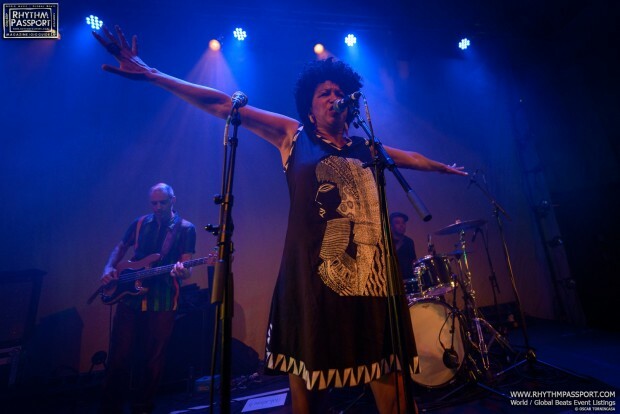 Metá Metá, supported for the occasion by an inventive DJ-set from Nina Miranda, are going to daunt some of the North and South Londoners’ attempts in the complex journey of merging progressive jazz with Afro-related rhythmic and melodic nuances. These guys seem to have performed their well-rooted powerful stances since they started. Their latest LP MM3 has merged, even further, the organic groove with the rigour of social matter; the delivery behind the music aims to express furious combativeness towards the dishonesty of Brazil’s government and their crimes of corruption. The fundamental nexus is the full-bodied vocal work of Juçara Marçal, the dynamic and precise waterfall of chords at Kiko Dinucci’s guitar, and the multiple tastes of the special touch of Thiago França on saxophone and flute. It’s a very interesting invitation to welcome Metà Metà in the contemplation of unbounded jazz music.